Pilgrims from the Mayflower landed in Provincetown in November of 1620. Finding conditions on the Outer Cape too inhospitable, in December the pilgrims settled instead in Plymouth, Massachusetts. After the American Revolution, Provincetown became a fishing and whaling center. 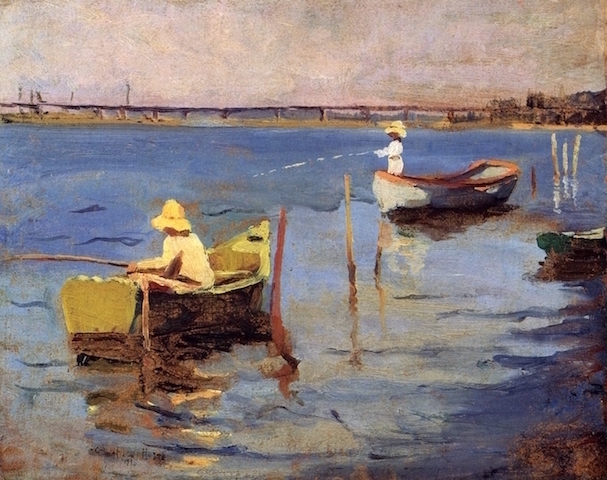 In the late 1800s, Provincetown began to draw artists and writers. The Cape Cod School of Art, a school for outdoor figure painting, opened in 1898. By the early years of the 20th Century, an experimental theater company, The Provincetown Players, a collective of artists and writers that included playwright Eugene O’Neill, had developed an international reputation. Founded in 1914, the Provincetown Art Association became a refuge for artists escaping war-torn Europe. The Fine Arts Work Center was founded 1968. Since then, Provincetown has continued its tradition as a center for the arts.